For some reason, the public can never get enough of the lavish, often breathtakingly beautiful, nature of celebrity weddings. A-listers know just how to turn it up a notch when planning a holy union, and always offer plenty of big-day inspiration for our own wedding plans. Get lost in the dream world of limitless finances, and check out just how fanciful your dream wedding could be (with the right sized bank account, of course). Here are a few snippets from some of the most iconic celebrity weddings of all time. You may commence drooling. Grace Kelly has often been referred to as the original princess bride. To be released from her contract with MGM, Grace Kelly agreed to allow the film studios to document the event on camera. Kelly met Prince Rainier of Monaco at the Cannes Film Festival, and the rest was media history. The dress Kelly wore during her famed union was created by Helen Rose, who had already won an Academy Award for her costume design. 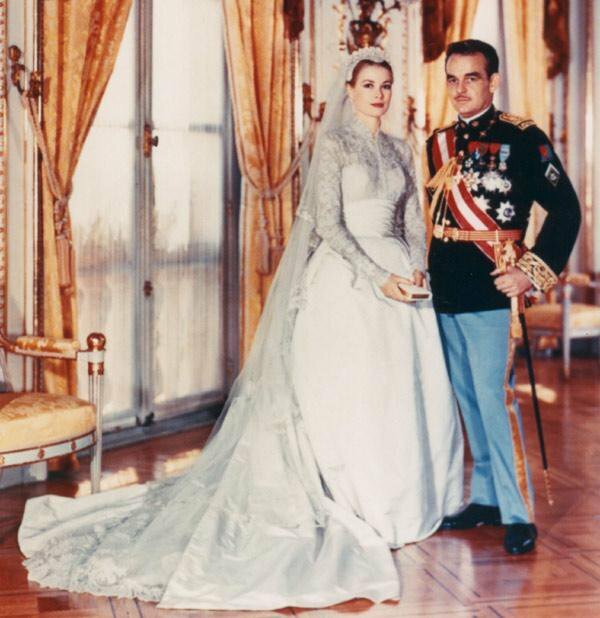 Grace Kelly’s wedding dress took nearly 30 seamstresses and three weeks to complete. There were 300 yards of lace and 150 yards of taffeta, tulle, and silk used to create the historic ensemble. It seemed the whole world tuned in to watch Lady Diana and Prince Charles tie the knot. On July 29th, 1981, 750 million people turned their televisions to witness the two say their, “I dos,” and there were plenty of iconic moments to be remembered. Princess Diana’s dress, the tiara, and her spicy omission of the promise to obey the Prince all made history, along with millions of smiles around the world. Most of all, Princess Diana’s iconic wedding ring make a mark in the minds of us all. Diana’s ring was an 18-carat oval sapphire. Thirty years later, the ring made another appearance on the finger of Kate Middleton, as Diana’s son got married for all the world to see. Even though they didn’t live happily ever after, the marriage of Jennifer Aniston and Brad Pitt made women all over the world swoon. Just a few days ago, there was even a huge gossip piece going around the internet stating that Pitt and Aniston had remarried and plan to have a child. For some reason, the world can’t stand the thought of losing hope on this sweetheart couple. The marriage of Kate Middleton and Prince William effectively “broke” the internet. So many people had interest in seeing everything about the union, that you could say the real message got a little lost in the fame of the wedding. Kim and Kanye were caught in one of the most beautiful and memorable wedding photos ever taken, and the world was watching. It has been said that Kanye worked on photoshopping the picture for four days before he actually let anyone post it.